Calling All Star Wars Fans!! Launching on Wednesday March 9, 2011 at 12pm ET through Saturday, March 12, 2011 at noon, Gilt CHILDREN (gilt.com) invites members to a curated selection of 30 hard-to-find vintage collectibles — hand-picked by Brian Semling! Brian Semling was born in 1977, the same year Star Wars was released. Perhaps that explains why Semling—one of the foremost US authorities on vintage toy collecting—has such a knack for finding collectibles from the seminal series of films. He dove into the enterprise full bore in 1994, and over the last 17 years, he has established himself as one of the best in the game. If you are searching for that proverbial needle in the haystack, he is the guy to help you find it. 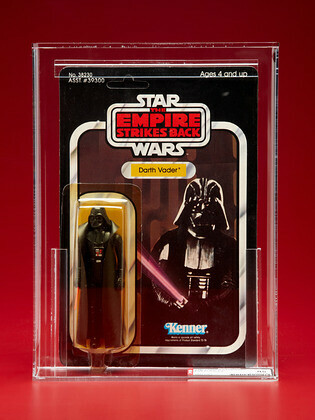 This collection of 30 hard to find Star Wars pieces is a treasure trove of vintage goodness. All items were rated by the Action Figure Authority (AFA), so rest assured that everything is collectible-grade and the condition is accurately represented. Thus the rarity of these authentic, sentimental items is truly invaluable. From single figures, to playsets, to one ultra-rare Imperial Forces 3-pack—it’s the perfect find for any die-hard collector.